2018 in Denver was full of great memories and inspirational moments for NIRSA Annual Conference attendees, presenters, and exhibitors alike! Each year, NIRSA members look forward to the annual NIRSA family reunion for many reasons. People who come to the NIRSA Annual Conference—whether it’s their first or their fortieth—revel in the opportunities to strengthen their skills, discover new ideas, connect with colleagues new and old, and explore new products, services, and more. In short, it’s a place where NIRSA members go to elevate their professional paths, strengthen their competencies, and join their colleagues in campus recreation and wellbeing for the purpose of advancing the profession. The NIRSA Annual Conference is a once-a-year opportunity to reconnect with old friends, embrace new ones, and learn all about the latest trends in collegiate recreation. 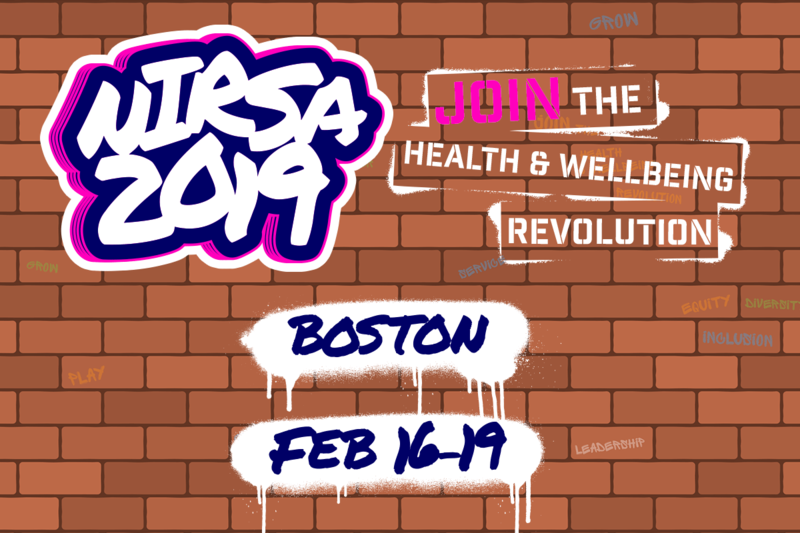 The 2018 NIRSA Annual Conference & Campus Rec and Wellness Expo more than lived up to the expectations of thousands of attendees and exhibitors who are already excited for what NIRSA 2019 in Boston will have to offer. There is no more extensive, annual professional development opportunity for campus recreation professionals and students than the NIRSA Annual Conference. It’s the place where leading professionals and institutions come together to showcase best practices, cutting-edge programs, assessment findings, and life-changing stories. As usual, the conference presented members with some amazing keynote addresses. 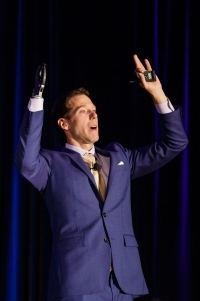 Aron Ralston kicked off NIRSA 2018 with an inspiring presentation about overcoming adversity while Ross Shafer’s Closing General Session address asked members to consider how they can offer participants friction free experiences. From hallway meetings to planned socials, the connections made outside of educational sessions are also a huge part of the NIRSA Annual Conference experience. The Denver Convention Center was milling with people during both the People of Color Social and the LGBTQI & Friends Social, both of which were generously sponsored by PLAE. Everyone came ready to celebrate some of the diversity that makes our Association so wonderful. Many also took advantage of the opportunity to connect with colleagues amid the stunning backdrop of Sports Authority Field at Mile High. The Campus Rec & Wellness Expo was amazing this year! The exhibitors who displayed their products, services, technologies, and more continue to shine an amazing spotlight on what’s hot in campus recreation. NIRSA members bring tremendous value to the field of collegiate recreation. Whether they are professional members inspiring passion within student members, student members going above and beyond, or institutional members finding creative solutions, NIRSA members strive to recognize the excellent work of their colleagues and the Annual Conference is where NIRSA awards are distributed and celebrated. NIRSA members love a challenge. The NIRSA Foundation’s ambitious goal was to raise $81,000 during the annual conference campaign—and our donors blew it out of the water by raising $85,278! Thanks to everyone who donated or stopped by to learn more about the opportunities provided by the philanthropic arm of NIRSA! The NIRSA Foundation Board is thrilled by the outstanding engagement of all our donors but want to give a special shout-out to the 2017–2018 Student Leadership Team—their hard work will send three student scholarship recipients to NIRSA 2019 because of the “By Students, For Students” initiative! Your donations continue to create opportunities for the NIRSA Family through the NIRSA Foundation’s four fields of interest: scholarships, research, student officials development, and leadership. Inspiring educational session and guest speakers, countless chances to network, so many preconference opportunities, a dynamic Career Services Center, NIRSA 2018 had something for everyone! So, what keeps NIRSA members coming back year after year to the NIRSA Annual Conference? We asked a few NIRSA 2018 attendees to explain what makes the annual family reunion such a treat—why they look forward to embracing the opportunity to elevate their paths with so many members year after year. Thanks to all the sponsors and volunteers who made NIRSA 2018 in Denver such a memorable and worthwhile event for so many.